Botulinum toxin options: Joel Schlessinger MD provides comparisons/contrasts. | Joel Schlessinger M.D. 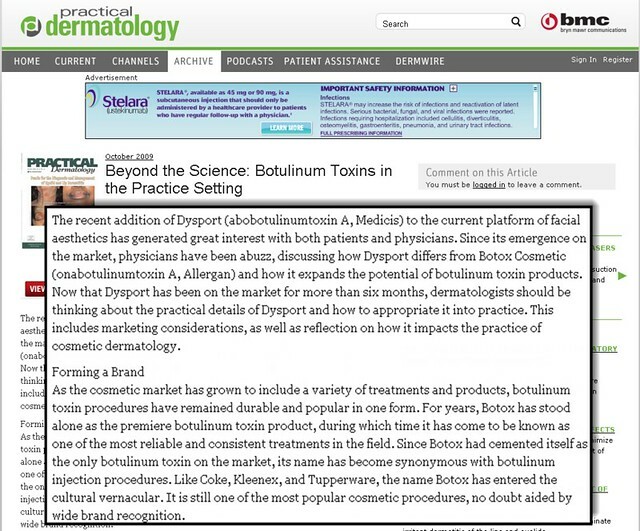 Joel Schlessinger MD discusses Botulinum toxin options and what that means for your dermatology practice. For years, Botox has served as the premiere botulinum toxin of choice and it is now one of the most recognizable cosmetic procedures available today. Because of this, many people would select this procedure; however, as the market leader, it comes under criticism – and, for those people, Dysport is an option to consider. The doctor is not suggesting that Dysport is superior to Botox, but he does believe it’s an important alternative to consider. A certain percentage of patients see better results with Dysport, especially if they have larger treatment areas or if they need longer results. Dysport can also be an excellent choice for younger patients in need of a smoother look. Joel Schlessinger MD also offers insight into touch-ups and follow-ups of cosmetic procedures. In “Ask an Expert: On Touch-Ups and Follow-Ups,” the doctor provides guidelines on when he might provide a touch-up treatment and how he handles follow-up visits after a cosmetic procedure. « Joel Schlessinger MD shares strategies to help any dermatologist successfully implement cosmetic services into his or her practice.